Angelic Nguyen has many years experience as a silk painting artist, floral designer, graphic and web designer. Growing up with orchids and tropical flowers around her hometown near Saigon, Vietnam, her passion for orchids has shown up in her paintings and designs. After she and her family escaped from the Communists and came to the U.S. in 1990, she started a new life as a graphic artist at the San Jose Mercury News. She has been growing orchids for about 20 years, and started her company, Orchid Design, in 1999. Angelic works on orchid growing, orchid arrangement, graphic design, and web design. Recently she has also been concentrating on photography and has taken thousands of orchid pictures for promoting orchid shows. Orchids she grows include Cattleyas, Phalanopsis, Laelias, Dendrobiums, Oncidiums, Paphs, Phrags, Lycastes, Bulbophylums, Vandas; hybrids and species. She also has several rare Cymbidiums — standard, pendulous and peloric, and has done some hybridizing of Cymbidiums, Laelias, and Cattleyas. In the meantime, she enjoys finding different orchids blooming in her garden every day. Angelic was Art Director for the Cymbidium Society of America Journal in 2006, and served as the newsletter editor for the San Francisco Orchid Society for about ten years. She has been involved in many activities to support orchid societies with design and printing for postcards, brochures and flyers, and has also served as President, show chair, and as a board member of several Bay Area orchid societies. She is currently the show chair for the SFOS’s summer show, “Orchids in the Park”. 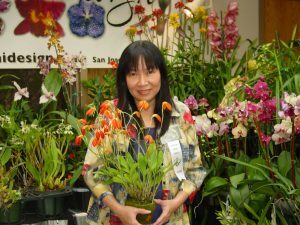 She’s also helping shows promotions, social medias advertising for many orchid, flower and garden shows in California. Orchid Design has been participating in the Pacific Orchid Exposition, the Santa Barbara International Orchid Show, the San Diego International Orchid Show, the San Francisco Flower & Garden Show, and many other shows for the past decade. She has also been giving orchid presentations and skill sessions for orchid and garden societies, using her experience and large selection of her photographs. She has spoken on a variety of orchid topics, including the 19th World Orchid Conference, Fragrant Orchids, Unusual Cymbidiums, Pendulous Cymbidiums, “Cattleya, the Queen of Flowers”, Laelia Species, and “The fascinating Orchids of Vietnam”. You can visit her website www.ORCHIDesign.com, email your orchid wish list to her: angelic@orchidesign.com or ask about something you would love to have in your orchid collection.